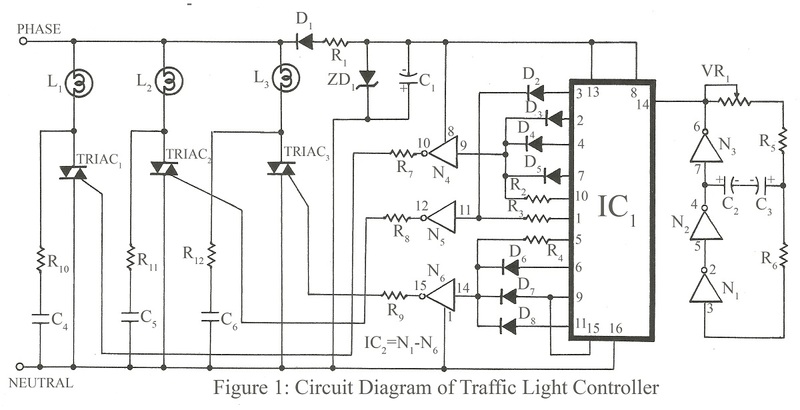 A 10V negative power supply is obtained directly from the mains my means of D1, R1, D2, and C1. Gates N1 through N6 constitute IC2 while IC1 is a Johnson counter. N1 – N3 are wired as an astable multivibrator whose time period can be adjusted between 1 second and 10 seconds with VR1. The decade outputs of IC1 are wired such that when Q0 and Q5 is high, the output of N5 goes low. 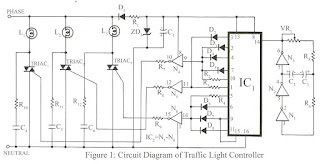 0 Response to "Traffic Light Controller circuit project"